We are almost finished with our build-oriented approach, however we do need to sit back and consider how Attack Bonus progresses and look at how that applies to our Example Monster before we move on to the final part - assessing the actual CR we have achieved. When constructing monsters with a build-oriented approach we assign Ability Scores well before determining dependent attributes, such as attack actions. And when evaluating a monster we often start by checking out its ability scores and how they align to the values we previously determined for that CR. Assuming we chose appropriate values at those points we shouldn't need to be too concerned about the "to hit" progression, right? Well yes, inside a build-oriented approach that's correct. But with a result-oriented methodology that's not the case, we certainly want to know those numbers for that approach. Additionally we need to know what these parameters should be for CR assessment, as it's a factor there. As part of my data entry I record the regular Attack Bonus of each creature, as it aligns with the standard method of generation we looked at in the last article. As one would expect this makes it rather simple to graph and analyze. 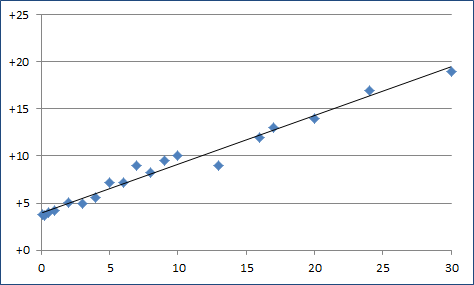 Plotting all the data in a scatter graph, with a linear trendline, the progression is quite easy to observe. The data points cluster relatively closely to the trendline for most CRs, although there are a few exceptions. In fact the average Standard Deviation for each CR is 1.2 and the average Var is 1.8. This tells us that we can be very comfortable with a +/-2 variability on the to-hit bonus we determine. And of course we can also adjust outside the +/-2 bounds if we make compensating adjustments elsewhere, but we need to be careful and it's probably best to have some experience building D&D 5e monsters before attempting it. This narrow band progression is due to two main factors. Firstly, the attack bonus is almost always derived from an ability modifier that is very close to the standard maximums we looked at earlier in this series. Secondly, monsters almost always have the appropriate proficiency bonus for their CR applied to their attack bonus. This leads us to expect a summarized version of this graph to be very close to the actual progression and that's exactly what we see. That said the relatively low volume of high-CR monsters in our sample does cause some variability at the end of the graph. 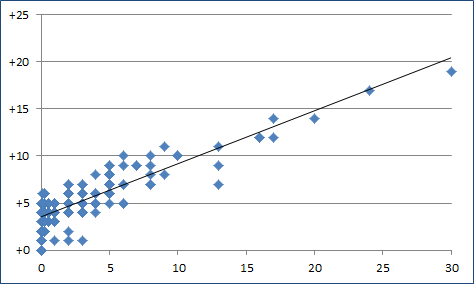 There are already posts on various forums suggesting simplified linear progressions for values like this. I've yet to see one that is a close match to what we've observed here though. All those I have seen produce results too low or high at one end of the scale or another. So what is a good match? To me a good match needs to be about +4 at CR1, run through +13 at CR17 and not quite hit +20 at CR30. We know the CR30 cap is +19, being +10 for max ability score of 30 (Player's basic rules version 0.2, page 7) and +9 for CR30 proficiency (DM's basic rules version 0.1, page 4). But it also needs to account for values below CR1. And while the average +2.2 at CR0 might be tricky to hit with a linear progression it certainly shouldn't be too far off the +3.7 at CR¼. Of course rounding will hide most of the details below CR1, but we should be close anyway as this lends confidence to our result. Kudos here to +Ford Davis for reminding me of the CR30 cap. As anticipated this progression doesn't quite produce a +2.2 value at CR0, giving a +3.49 which rounds to +3.0 instead, but it is a very close match for the remainder of our criteria. As previously discussed values for attributes below CR1 do tend to skew a bit because of the low granularity and this slight skew in accuracy isn't too big a deal as CR0 monsters pose almost no threat to PCs, even at level one. Note that a process-oriented build is normally going to result in a +2 if it uses ability scores close to those we previously discussed and our +/-2 margin does allow for the difference, while Bounded Accuracy further reduces possible issues to almost zero. Personally I have no problems using this progression as-is rather than trying to compensate with hand editing. Naturally readers are welcome to tweak it to +2 for their own use. Prediction: The majority of CR30 monsters will have a normal attack bonus in the range of +18 to +19. We don't really have anything to add to our example monster in this instalment. All that we can really do here is consider the pyromancer's attack bonus. The Spellcasting Trait includes a spell "to hit" value of +7. This is a one higher than the +6 we believe is standard for CR5, but well within the +/-2 standard variation we declared earlier. So this is a good fit. Our Dagger action is really only present for opportunity actions and that means it's +5 "to hit" being one low of appropriate for its CR should be just fine too. So overall I think the pyromancer sits well, from an attack bonus perspective. Next time we'll have a look at how we can evaluate a monster's Actual CR once we think we have finished working on it.